"Vegetable fried rice includes all vegetables with its unique flavor and colour..The success of this recipe is when each grain is separated and vegetables are cooked in crisp without loosing its colour"
Pick and wash the rice in enough water and drain. Boil water and add rice, salt and drop of oil in it. Cook uncovered in low flame till the rice is tendered. When rice is done keep it aside uncovered. Now take deep kadai or wok and put oil in it. Add the vegetables chopped and stir fry it for 3-4 minutes. Make sure that the vegetables are not over cooked it should be bit crisp. Mix salt and pepper to taste and dont forget that the rice is cooked in salt so add accordingly. 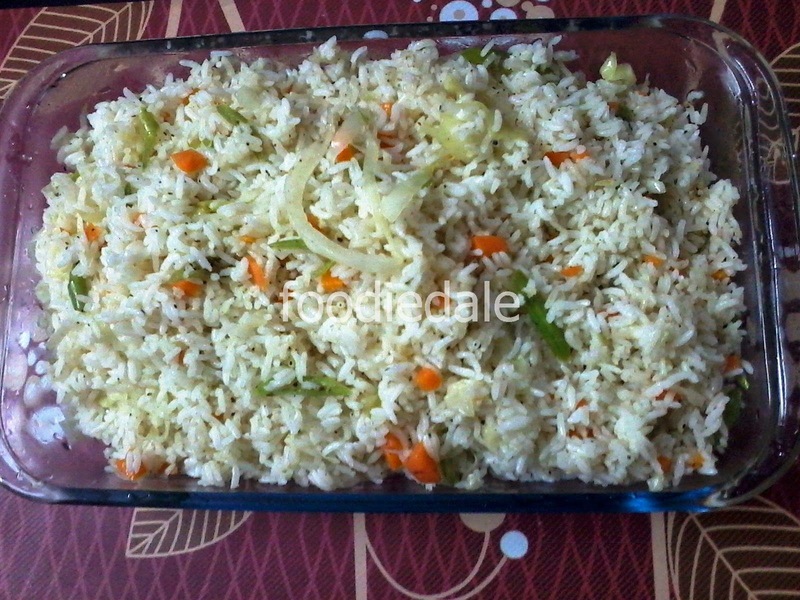 Now add the cooked rice into the vegetable and mix it by using a fork so that the rice wont get mashed.